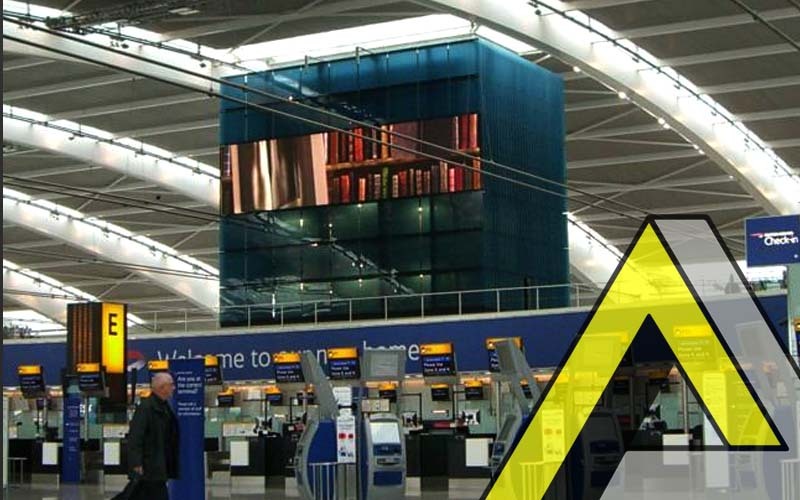 The British Airways Terminal 5 at Heathrow Airport required the installation of seven giant screens to create the biggest audio-visual display in Europe. Boldman designed, manufactured and installed the aluminium supporting structure on glass faced ventilation towers and then fitted 154 LED panels to each of the aluminium profile structures. We used innovative technology and design to meet the stringent requirements of the terminal’s architects. Boldman’s aluminium extrusion frame was specified as an alternative to the usual heavy and inaccurate steel structures, ensuring that the installation was flat and precise enough to deliver nearly HD quality display. Novel design features included a system of adjustable screws allowing the installation team to accurately align the 154 panels that made up each of the 14 x 4 metre screens, from the front face of the screen. Design of a suitable aluminium support structure and installation of the screen and panels presented a challenging task: the work was completed to the client’s tight deadline in time for the opening by the Queen on 14th March 2008. The cities of Bradford, Leeds, Swindon and Salford have also benefited from Boldman LED aluminium support structure providing the best quality picture content.